Oppermann Associates has been appointed as part of the Design Team for the new Gaelcholáiste Chiarraí in Tralee, Co. Kerry. The contract signing for the newly appointed Design Team took place at the Kerry Education and Training Board (Kerry ETB) Head Office on 3rd April 2017. This flagship project for Kerry ETB will comprise of a new 600 student post primary school and a Sports Hall with a total floor area of 6,540m2. It will greatly contribute to the regeneration of this part of Tralee. 2) Specialists room including multimedia, music, design and communications graphics etc. 6) Construction studies, engineering and technology rooms A school library, general purpose areas, students dining area, staff room etc. Oppermann Associate intend for the design to encapsulate the characteristic spirit of the school and in particular its Drama programme. “The construction of the new school and PE hall for Gaelcholáiste Chiarraí which is due for completion in 2019/2020 is a very significant and important project for Kerry ETB. 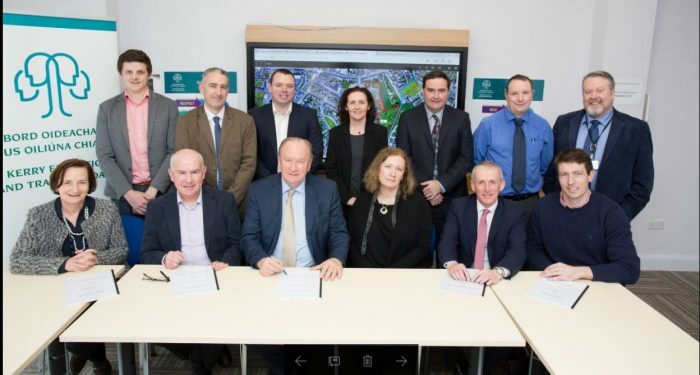 The ETB looks forward to the completion of the school building project on the site at Hawley Park which was transferred from Kerry County Council to Kerry ETB. The new school building when completed will provide state of the art facilities for the teachers and students.” said Kerry ETB CEO Colm McEvoy.